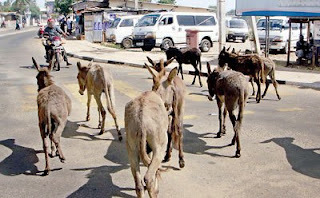 GWERU – It has come as a relief to Gweru residents after the City fathers made a resolution on Tuesday, APRIL 9, 2019 to shoot all stray donkeys. No resident will be allowed to keep donkeys in council area and stray dogs will also be shot on site. Residents in high density suburbs will be allowed a maximum of one dog while those in low density suburbs will be allowed a maximum of four. Donkeys are a menace in Gweru particularly in suburbs like Mkoba 4,5,9,10,18 and 19 where they destroy gardens and mess up the neighbourhood with their dung. These unattended donkeys come from rural areas around the city. The director of Healthy Sam Sekenhamo told reporters during a press conference at Council house that the local authority has noted with concern the damage caused by donkeys and increased dog bites in the city so councillors have passed a resolution to shoot all stray animals. Sekenhamo also said that for residents in high density areas like Mkoba a house hold is allowed to keep not more than two dogs and low density suburbs resident are allowed four dogs only and they should be secure. The local authority advised residents to either relocate some of their dogs if they are not secured or place them at the SPCA before 15 April.